While UFC 136 does not have a marquee mega fight that will produce a lot of fan fare, it is the most well rounded card of the year as every fight is intriguing and well matched. Two title championship fights headline the card with the return of one of the most controversial fighters the sport has seen in years. The Facebook Prelims start 5:45 p.m. EST and the Spike TV Prelims start at 8:00 p.m. followed by the PPV beginning at 9:00 p.m. EST. Melvin is the favorite and rightfully so. However, Lauzon is the best underdog on the main card because he has built his resume on winning fights he was suppose to lose. The one thing Lauzon has against him is that his performance declines as the fight goes on. Melvin will push the pace and if he hurts him, he will not hesitate to finish. What was celebrated as the first featherweight bout in UFC history turned into a sea of controversy when Leonard Garcia was awarded a split decision victory last December. 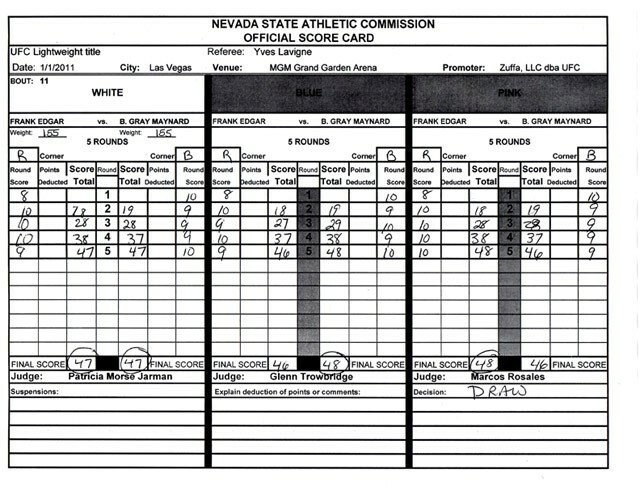 Judges Adalaide Byrd and Tony Weeks were the only two people in the building that night who thought he won as Leonard looked like a surprised kid on Christmas morning when Bruce Buffer announced him as the winner. Leonard took the first fight on 16 days notice, but he took this fight on 4 weeks notice. Garcia’s style of just winging punches with reckless abandon never changes. Nam is the better striker and will learn from his “mistake” in the first fight. The fight itself will prove to be a battle of wills inside the cage. Stann will try to engage with his stand up while Sonnen will look to control the action with his wrestling. Chael’s weakness is unquestionably his submission defense. Stann does not have the pedigree on the ground to catch him in a submission. He will have to avoid Sonnen’s mixture of punches and elbows from the top position and scramble back to his feet in quick fashion in order to improve his chances. In the end, wrestling will be the key factor, as I don’t see Sonnen having problems taking Stann down since he has no problem taking down higher caliber opposition. Jose Aldo’s aura of dominance was shattered in his decision victory over Mark Hominick back in April. It was the first time he looked human which has some second guessing his “Pound for Pound” status as only a win in spectacular fashion will put the naysayers to rest. This will be Kenny Florian’s third title shot in a sport where most fighters never earn a single opportunity. The 35 year old Boston native is an intelligently well rounded fighter with world class Jiu-Jitsu. This will be, without question, the toughest test for the 25 year old champion. Kenny has extreme difficulty against fighters who are stronger and or more dynamic such as his losses against Sherk, Penn and Maynard. If you add faster to the equation, that is what you have with Aldo. I would not be surprised at all if Kenny wins this fight but I do not believe the third time will be the charm. This has to be the hardest fight of the year to predict. Maynard dominated Edgar in their first encounter en route to a decision victory in April 2008. Maynard brutalized Edgar in the first round of their second fight to earn a 10-8 round. Then something happened. Frankie Edgar came to life and used superb scrambling and excellent footwork to earn enough points for a draw. Frankie is technically the better striker but Maynard has more power in his punches. Edgar will stick and move with strikes while Maynard is going to set up the shot with punches in bunches. Edgar is going to have to keep the fight in the center of the octagon in order to avoid take downs. The longer the fight goes the better it suits the champion. Gray’s best chance to win the fight is to finish Edgar early as his chances decrease with each passing round since Frankie performs better as the fight move on.